Recently, I’ve become increasingly convinced that Salesforce.com (NYSE:CRM) is an important barometer for the tech sector as a whole. CRM stock price isn’t the only gauge investors need to watch, But Salesforce stock still seems to provide a pure look at investors’ preferences. The key reason why is that Salesforce.com ‘s story is reasonably simple. It has a fantastic business. No one can dispute that. As CEO Marc Benioff pointed out on its Q4 conference call earlier this month, the company was the fastest enterprise software company ever to reach $13 billion in sales. (The company celebrated its 20th anniversary on Mar. 8) Its revenue growth has been almost bizarrely consistent for years now, hovering generally in the 24%-26% range. And there really aren’t any external factors that can materially change its outlook. Microsoft (NASDAQ:MSFT) and Adobe (NASDAQ:ADBE) are trying to compete in customer relationship management, or CRM, software, but the dominance of Salesforce.com appears assured. A downturn in the macro cycle likely would impact Salesforce stock. Of course, CRM stock price also isn’t cheap or close to it. And so Salesforce stock provides an intriguing answer to an interesting question: what, exactly, are investors willing to pay for growth? Coming off the company’s fourth-quarter report, it appears investors aren’t sure about the answer to that question. Once they figure it out, the rest of the market may as well. Salesforce’s earnings came in nicely ahead of Street estimates on both the top and bottom lines. That surprised exactly no one remotely familiar with Salesforce stock; as I wrote before the report, Salesforce.com hasn’t missed on either revenue or earnings in at least five-plus years. Yet it wasn’t good enough. The company’s guidance looks a bit disappointing, as Nicholas Chahine detailed after the report. The CRM stock price fell 3.7% on the day of the report and dipped almost 1% on the following day. Salesforce stock wound up falling 6% for the week, but it has since regained the majority of its losses. Bu the initial selloff seemed to confirm the risk facing CRM stock and the market. Bear in mind that the CRM stock price over time has been an exaggerated reflection of the market as a whole. It gained steadily in the first years of the decade, as the market recovered, and its gains accelerated in 2016 and 2017, as the stock market gained steam. Salesforce stock peaked in early October 2018 and then plunged as the Q4 selloff hit. CRM stock lost over 25% of its value in less than three months and took three and a half months to gain it all back, and then some. The profit-taking after the strong Q4 report seemed to suggest that investors were paying more attention to risk, but subsequently, as noted above, CRM stock regained most of the losses it had suffered this month. How High Can the CRM Stock Price Go? The issue at this point is that Salesforce stock is expensive, really expensive. It still trades at about 60 times the company’s 2020 earnings guidance. At some point, investors will start worrying about the valuation of even a great business, which Salesforce.com unquestionably is. From here, it still looks like valuation fears drove the initial post-earnings reaction. Disappointing guidance is a good talking point, but again, Salesforce.com never misses analyst estimates. It’s reasonably obvious at this point that the company guides conservatively. Meanwhile, Q1 and 2019 projections aside, the company also predicted that its revenue would double again by fiscal 2023. There was nothing wrong with the company’s Q4 results. The issue is its valuation. But there’s another aspect of Salesforce stock that could demonstrate investors’ appetite for risk. Salesforce.com predicts that its non-GAAP EPS will come in at $2.74-$2.76, but that includes stock-based compensation of $1.84 . That’s two-thirds of its projected net income. Back that out, and CRM stock is trading at over 172 times the high end of this year’s earnings guidance. Some investors have questioned whether Salesforce stock should have such a high valuation. If more investors agree, CRM stock likely would be the first stock to take a big hit. Between the stock’s valuation and the company’s share-based comp, CRM obviously is a growth stock. And the relatively simple nature of its outlook means there’s one key argument regarding Salesforce stock: what to pay for the business. Bulls will argue that paying up for Salesforce stock has been a great bet for nearly 15 years. Bears will reply that, at some point, the rally has to end. That argument is a stalemate right now. It’s worth paying close attention to who wins in the near-term. Where CRM stock goes, other growth stocks – like Square (NYSE:SQ), Shopify (NYSE:SHOP) and Workday (NASDAQ:WDAY) – are likely to follow. If Salesforce stock is too expensive, so is pretty much every other stock in the market; few, if any, of them have as an outlook that’s as good as CRM. If investors are willing to pay up for CRM stock now, however, they’ll likely be willing to stretch for other growth plays. The pre- and post-earnings movements of CRM stock price show the market isn’t quite sure which side to take. At some point soon, that will change. 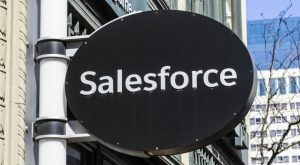 Article printed from InvestorPlace Media, https://investorplace.com/2019/03/keep-close-eye-salesforce-stock/.